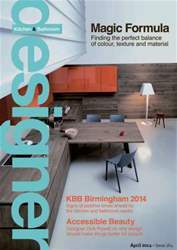 We’re still on a high from last month’s hugely successful KBB Birmingham. It’s always good to have the opportunity to catch-up with so many industry faces in one place, but this time, the show had a real energy to it that reaffirmed expectations during the build-up that business really is on the up. New launches, new exhibitors, and a strong presence from some of the industry’s big-hitters made for a great show, and we present some of the highlights in this issue. Speaking of new launches, we also look ahead to Eurocucina which takes place in Milan this month. As well as some fascinating new kitchen furniture designs, there will also be lots to shout about from kitchen appliance and bathroom manufacturers too.